I grew up across the Hudson, about 13 miles west in a town called Montclair. Our home stood on a hill on the western side of town, with my bedroom resting on the top, eastern side of our three floor Victorian. 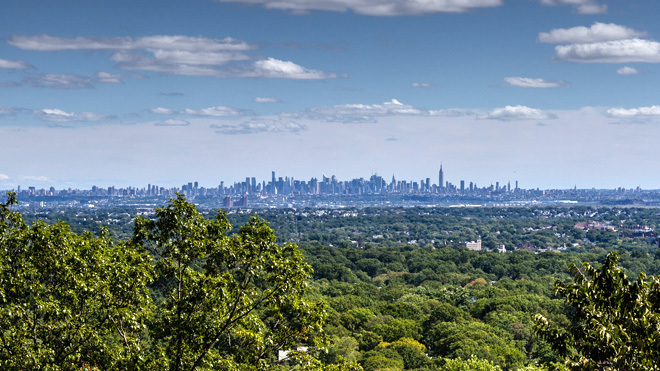 My eyes could skip over Anderson Park, past downtown Upper Montclair and over the thin tree tops in neighboring towns, catching the very tips of The City skyline. As a young boy that daily exercise both excited and enticed, as my minds eye continued on, landing me deep into the midst of Manhattan, my perceived gateway to the world. My parents are both artists and educators who met at Columbia University in the 60’s. As a child in the late 70’s, they’d take me and my brother to gallery openings in old Soho and to the West Village to experience (off) Broadway shows. Our days in The City were fun, provocative and inspiring. When family or friends came to town, we’d enter tourist mode and scale the Empire State Building for a die-cast statue and snapshots of the view down or dine at Windows on the World, pretending to fit in with our fumbled, New Jersey appearances and mannerisms. The City was as big as the world; they were one and the same to me. From an early age, my parents allowed me the freedom to explore my surroundings in our neighborhood and around my suburban town, but on their terms, making sure to teach me the basics before letting me out the door—to always look left and right before crossing the street and call home collect whenever I needed a ride. America circa the 70’s. Times in the suburbs were much simpler back then. Conversely, the streets of The City had a different lesson in tow. Whenever I visited, The City schooled me that a world filled of vertical cities lived above street level, while below the streets, the world was connected, full of roaming individuals whom I couldn’t engage with by conversation or by sight. That’s how people are taken advantage of! The City spoke so I listened, because I trusted The City. It was everything I dreamed of being; creative, mysterious, exciting, fun… I learned to glance and frame the moment of people, places, and things; take it all in, but mind your own business was the underlying lesson I learned. These two sets of rules—my parent’s light schooling of linear confrontations and the hierarchical laws of The City—represented the checklist of street smarts I owned at age ten. Now 34, though schooled by many more life lessons of much greater complications, I continue to think, dream, plan, and move about my life with these early lessons in tow. Because The City gave me Don Quixote and Starlight Express and George Segal pedestrians and giant, 5-foot pencils and toothbrushes on West Broadway. It gave me the Bronx Bombers, the Macy’s Thanksgiving Day Parade and hot dogs on the sidewalk. It even gave me Yellow Cabs with mini, fold-up seats facing away from the driver, which perfectly fit my smaller frame. The City bought my complete trust with the allure of growing up to possess a soul similar to the Great Grid and all that lay in-between. So I walked between the buildings and never looked up; I glanced at the people and never saw a face. In 1996, my first gig in The City had me commuting in from Jersey City—a large, underdeveloped, undervalued coastal city on the New Jersey side of the Hudson and a solid 45 minute commute away. I worked just below Canal Street in a multimedia shop set above a Futon outlet; one of the twenty some-odd Futon stores on the block. My daily trek proved to be a nice contrast to my previous reverse commute deep into the Western expanses of New Jersey. Once I landed in Manhattan at the WTC PATH station, I’d ride the packed escalators to ground level and walk the twelve blocks to my job, breathing in the fresh air of downtown Manhattan, mixed with the smell of roasted peanuts and my fellow commuter’s secondary smoke. I’d stop at the same street vendor to pick up fruit and coffee before settling into my studio window desk seat that overlooked the ancient rooftop water towers sprinkled across the Soho skyline. As the long day of animating cartoon characters and holding lunch meetings at classic spots, such as Fanelli’s and Bar 89 came to a close, I looked forward to the walk back to the WTC, and the ride under the river’s surface to my affordable existence. It wasn’t what I had imagined growing up, but I was finally living a dream within the gateway. Just as I felt my dreams of experiencing The City beginning to come together, my daily trek began to take on a different vibe. I began to loathe my commute, with the crowds of suits on the PATH and our long escalator ride up into the heart of the WTC underground mall, squashed together like sardines. Innocuous moments became unbearably annoying. Experiences like passing the WTC Disney Store each morning as I approached the exit to street level began to chew on my desire to be a part of a less commercialized world. The business epicenter of downtown Manhattan was eating away at me; more and more, I actually became upset watching three-quarters of my fellow travelers disappear every morning like worker ants into this building, a structure that I now only used as a thousand foot-tall roof twice a day and a directional beacon while uptown. What happened to the romance of The City? In my 25-year old mind, the WTC—my newfound entrance and exit point of The City—began to viscerally represent the home to corporate yes men; guys who would just as soon knock over a woman stepping onto the PATH as they would verbally drool over her once they landed their prime positioning in front of the opposing exit door. The PATH was so crowded at times, I actually witnessed smaller people get lifted off their feet in the shifting and shoving and cramming of bodies to get to work, or more direct to the point, to get to a pay day. It was around this time that I was struck by a profound realization; not only had I broken one of the golden rules I learned from The City as a child by gawking at a vertical city, I’d been gawking at the epitome, the archetype of a vertical city. A valiant effort indeed, but this time, I wasn’t buying. My eyes were open, as prolonged glances into the eyes of the people who surrounded me provided me with droning negativity in return—the pangs of repetition; the exhaustion; the real-life scheming of men and women desperate to keep up with the Jones’—they made my shift in perspective clearer each day. Now when I walked through the grid of The City, each of the vertical cities above ground began to take on a new representation to me. Hierarchy, wealth, and confliction loomed over the masses of citizens who were both explicitly and implicitly schooled to not look into the eyes of the beast as well. I came to the conclusion that by not looking all these years, really looking at what was happening in those corner office expanses, we were each complicit in allowing these vertical cities to intimidate our lives with dangled carrots and unattainable conclusions of never ending pursuits. To completely unravel and digest such a revelation, I knew I needed to shift gears, both psychologically and physically, so I left town for the rural expanses of the Birkshires and the promise of Silicon Village. When my 10 year-old mind’s eye had constructed the essence of The City, it romanced the Great Grid, but not the office towers with white collar whips; it romanced the unknown personalities, the diversity, and the creativity of the people of New York City themselves. Once clear of a visceral connection to these expansive white collar, networked resources, only a matrix of interlocking paths of human relationships remained. It was criminal how long it took me to recognize the situation as such. Tonight marks the fourth day of the second week of my new life in Greensboro, North Carolina. The last time I left The City it ended up as only a brief respite, serving as a pit-stop before heading back to reconnect and take on the vertical cities from within. I’m not so sure I’ll take the same path this time. Maybe I’ve come to realize that seeing my passion to fruition won’t occur within a representation of the confrontational juxtaposition itself. Maybe I’m better off planning, expressing, and implementing from a room on the eastern side of an old wooden home, with a window overlooking the thin, slumbering Oaks and Elms of a quaint town, while the far off tips of a different skyline glistens in the early morning sky. Maybe I’ll now feel comfortable looking directly into the eyes of my fellow travelers, and explore relationships with the people underground and above—walking proudly with the roaming individuals themselves. Note: Today marks the four-year anniversary of the tragic events of 9/11. Prayers for those who were lost or affected, which on my most clear days I realize includes myself. To those who abused their power by responding with an obtuse war to such a criminal act, there’s a special place in hell for you.